Disneyland is far different than any of the Disney World parks. Disneyland characters can roam about the park and many don’t have character attendants nearby or Photopass photographers. 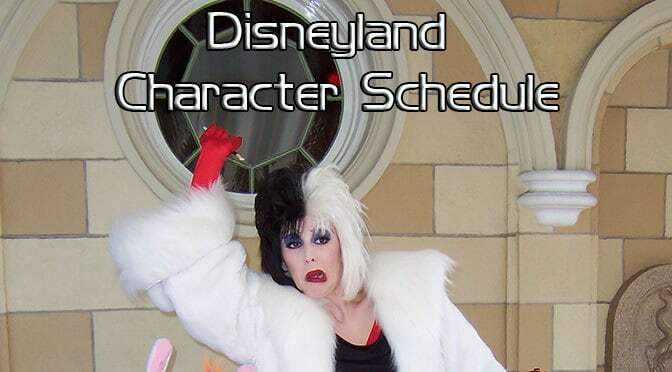 I’ve composed a list of characters that you MIGHT find in the park, but few are guaranteed on a given day or given time as Disneyland doesn’t publish its character schedules. Report your finds in the comments below! TIP: Many characters listed in Fantasyland like Mary Poppins and Peter Pan roam freely about the land. They will take photos and sign books, but rarely have lines. Lines are common for Tinker Bell, Winnie the Pooh, Princesses, Marvel and Star Wars Characters. TIP: Enjoy a fun time with Alice, the Mad Hatter and friends by playing musical chairs at the Coke Corner around 2pm! Continue to the California Adventure characters on Page 2! Can you still meet Russell and Dug at Pixar Pier? I haven’t seen them there recently. Are the Disney Junior characters like Jake, Sophia, or Doc still at California Adventure? I know there on your app but I haven’t seen them there lately. Any idea if Baloo will be a character available this year? We are planning a trip to Disneyland and this is my favorite character and we’ve never had a chance to meet him. Does the Beast still roam around? I have tried to no avail for 14 years to get a pic with him. We are going to Disneyland for the alloween party this year and would love to get that pic! We were very fortunate yesterday with some rare roaming characters out in Fantasyland. In one place we met the Queen of Hearts, both Tweedles and White Rabbit. Only Queen was signing. The others were posing for photos and carrying on. We were very happy to find them. They didn’t show up on the app. They were just there. Love this aspect of DL. We met pinnochio, Geppeto, and Gideon in Fantasyland together! I want to know about this Thanksgiving Feast. Please explain? Sounds fun!! Can you please give me a run down of characters at DCA? I cannot access page 2 for some reason. Is there a meet and greet for Moana at DL or DCA? Thanks for the info. We met 13 characters in a little over an hour at Breakfast with Minnie and friends. The interaction was awesome too! The only character that we met that wasn’t on your list was Gideon. Hi Kenny, great list… I’ve met some tough ones the last two years at the thanksgiving feast in the Disneyland Grand Ball Room with my family. Horace Horseshoe and Claira Bell. Pinocchio, Honest John, Gideon, Big Al and others have been there the last two years… will be there a 3rd time this year. My comment above was suposed to be here. We have used ParkSavers twice. Once it Disneyland and went to Disney World. We had no problem with using our tickets. We also found the company was very responsive and we had questions before we purchased the tickets. When you go to Disneyland make sure you follow the instructions and take the tickets to a ticket booth to exchange them for your actual tickets. We saw lots of people trying to go through the turnstiles with them and it won’t work that way. (It’s more simple at Disney World, because the tickets can be linked into your MDX account) We researched and both times, we saved the most with Park Savers. Kenny, wasn’t sure where to ask this question but seems this is the place for DL info. When you go, do you purchase your tickets directly from DL or use a 3rd party vendor? I’ve read about a site called ParkSavers.com but wondered whether you’ve dealt with them and found them to be reputable. Thank you in advance. Anna and Elsa are continuing to offer a meet and greet. Will they still have the meet and greet in California adventure park? Is sulley from monster inc still there? Not really NEW news any more, but for fans of Belle: She now meets in the blue dress outside at Fantasy Faire. If you want to see her in the yellow dress, meet her after one of the first two shows in the Royal Theatre. Roger Rabbit, the Easter Bunny, the White Rabbit, Rabbit from Pooh, Thumper, Pluto with Easter rabbit ears, and Mickey & Minnie dressed in fancy Easter clothes can all be met in Frontierland at the Big Thunder Jamboree. Big Thunder Ranch no longer exists. Can anyone tell me if the villans around right now or is that just Halloween? If so do they do meet and greets? Only Cruella is out before Halloween. Don’t Dr. Facilier and Capt. Hook have regular meets? The Evil Queen is also in Fantasyland year round. We’ve met her by the Wishing Well and in front of Pixie Hollow. Listed as Queen Grimhilde here. I suppose Alice can still be considered “common”, but considering several recent days when Mad Hatter has appeared alone, I have to say that she isn’t an “every day” character now. Darth Vader can be reclassifiied as very rare for meet ‘n greets – Kylo Ren takes over every day in SWLB. I have never seen this personally, but when Jedi Training is cancelled due to rain, Darth Vader and some others may hold an improptu meet ‘n greet session. Boba Fett is now in fact common, but “officially” secret, as you can find him the SWLB cantina, but it’s not publicized by Disney. Flynn Rider is now “common” at Fantasy Faire with Rapunzel – outside at the “umbrella at the corner” You can put Anna & Elsa (together) as the same. I would change Ariel to “rare” in the Royal Hall or outside at Fantasy Faire now, but common at the wishing well – in rotation with Aurora. For those visiting DLR in Spring : Frozen will no longer be performed in the Royal Theatre – Beauty and the Beast wil return. This means that it is practically certain that the Anna & Elsa meet ‘n greet sessions will be history – replaced by Belle outside. The changeover is happening right now – the Royal Theatre is temporarily closed. “Beauty and the Beast” will return to Friday, 3/9. I presume that Anna & Elsa are already gone from Disneyland Park and that Belle will start doing meet ‘n greets outside while Tangled is being performed. Dr. Facilier had several meets on the docked Mark Twain Today! These are good to have! We’re making an adults only trip in just 20 days! (It’s our 10 year anniversary) I LOVE your WDW maps and was wondering if you have any for Disneyland and DCA? That would be super!! If not, well, I guess you still rock anyway! Thanks! Kenny, it looks like we may be making a day trip to Disneyland while we are visiting SoCal this summer. We are from NW FL, and we’ve been to Disney World twice in 2015. Which park do you recommend visiting? If it was just my family of 4 (kids 4 and 7), we’d probably try to power through and hit the highlights of both. But, it’ll likely be a larger group with extended family–kids ages 4-13 w/ parents and grandparents. The older group of kids (9, 10, 13) are from Omaha and haven’t really done Disney. I’d love to hear your opinion. Thanks! We had the same characters at breakfast on 10/1, with the exception of Suzy (one of the mice from Cinderella) instead of Gideon. Gideon was at Plaza Inn breakfast as of September 2015. Minnie, Fairy Godmother, Tigger, Eeyore, Pooh, Captain Hook, Rafiki, Chip & Dale, Max, and Gideon all made appearances when we visited! Talk about bang for your buck, as far as character meals go! Also, sounds like the holiday time Big Thunder Jamboree characters are being moved to Critter Country, so DL can close BTJ for start of Star Wars land construction. Hi, thanks for all of your help earlier this year at WDW. We are headed to DLAND and were wondering if they have talking Mickey. I’m thinking not after all the googling I’ve done but I could be wrong. Fingers crossed! I didn’t realize you were perlster! Thanks for sharing. I’ll look through them and see what we can share with character fans. Actually, forget “only in summer”, since I’ve seen evidence that it happened 3 months ago in addition to very recently. Here’s a new “secret” appearance – Tiana on the Mark Twain. I’ve never seen it listed anywhere, and can’t even say for sure how long its has been going on – maybe since last year, but could be only in summer. i’m almost sure it would be only one trip on the Rivers of America per day – time has been said to around 3 PM. I do like to take photos when I’m at Disneyland – a lot of photos. The problem is my internet connection has slow uploading, so although I do have a flickr account (should be linked to in my name), there are now thousands of photos that are basically stuck on my PC. A photo essay – especially of July 17 – sounds interesting. It’s looking very likely that I will be at Disneyland that day. If so, I’ll leave a comment her on the 18th. “Snow White’s Queen” (apparently nobody but Disney calls her Grimhilde) is listed twice – the first one seems to be for Snow White herself. Given that locations have changed in the recent past, and probably will again at some point not too far in the future, I won’t say I have any corrections. Instead, some observations from my June 8 visit. Belle, Cinderella, and Snow White were in the Royal Hall. Merida and Rapunzel rotated appearances outside – but also within Fantasy Faire. Ariel was by the Dumbo organ. Aladdin, Genie and Jasmine were just outside the entrance to Aladdin’s Oasis. I have her listed as Grimhilde on my app, but most people argue with me, so I went the easy way :) Look forward to your updates. Perhaps you could do a photo essay on your visit sometime??? to DCAP. One obvious issue are that the Haunted Mansion and Space Mountain overlays can’t be moved, so … who knows? Hope they leave it at DL. I did the one at DCA a while back. I was at Disneyland on June 8. Thor and Captain America are meeting outside in Tomorrowland across from [the former] Innoventions, by the cylindrical building with the satellite gear on top. There is only one line to meet one, then the other. Thanks Gerry. I really need to come out for another visit. Maybe Halloween? Oh yeah, we met the Genie in Adventureland near Aladdin’s oasis. Minnie’s and friends’ breakfast at the Plaza Inn had an impressive line-up of characters. We met Fairy Godmother, Max, Tigger, Eeyore, Peter Pan, Captain Hook, Chip and Dale, Minnie, and Rafiki. Evil Queen and Fairy Godmother met behind the castle. Sleeping Beauty was at the wishing well to the right of the front of the castle. Rapunzel, Merida, and Ariel met to the left of the front of the castle near fantasy faire. Snow white, belle, and Cinderella was at fantasy faire. Mary Poppins and Bert were in the shade near the matterhorn. Captain Hook was behind the dumbo rude in the shade. Woody and Jesse met near the entrance of the petting zoo near big thunder ranch. Tiana was near pirates of car. ride. Pooh, Tigger and eeyore was near Winnie the pooh ride. Cruella Deville met near town square. We saw Alice, mad hatter, and peter pan out and about, but never actual saw where they went. Chip, dale, mickey, minnie, pluto, goofy, donald, and daisy met in anniversary attire at town square. Met springtime characters, but this is last weekend to meet. Met fawn and tinkerbell at pixie hollow. Other fairy often meeting according to cast member is silvermist. New as of 5/21: I’ve seen a report of Captain America and Thor greeting guests outside in Tomorrowland. You line up once and meet Thor first. The location is across from Starcarde, near the DVC booth. Gerry, is stage 16 in DL or DCA? Not familiar enough with the parks to know. Fastpasses are required to meet Olaf – but they are not linked, so you can also get ride fastpass without having to wait. It’s now 2016 is a fast pass required still. And if it is, where do u get it ?? The meet ‘n greet is listed by Disney as “Meet Tinker Bell & a Fairy Friend at Pixie Hollow”. Other fairies listed are Vidia, Terence, Fawn, Rosetta, Silvermist, Iridessa.and Periwinkle. However, Vidia, Terrence, and Periwinkle are generally considered to be no longer appearing in Pixie Hollow. Since the latest movie involves Fawn, she’s probably most often the second fairy present..
Gerry, Is Tinkerbell, Rosetta, and Silvermist the likely fairies that rotate through Pixie Hollow? Just wondering what the chances of meeting Fawn, Vidia, and Iridessa are? Although not officially announced, the disneyland web site implies that Captain America and Thor will be returning at some point. Let me know if you see them again and I’ll be happy to add it to help others plan. Gerry, please keep posting updates for Disneyland and California Adventure Park characters. Heading to California the first week of June. My girls want to meet as many characters as possible! So any updated information will be helpful! Many thought that Captain America & Thor would hold meet ‘n greets in Starcade, but two days have gone without them being seen. Thumper appears in BTRJ during the Easter season (see other comment). Oops – no editing function, so .,. Correction – Cinderella is often in the Royal Hall. Aurora has recently been by the castle, probably the right side (from Main Street) – by the wishing well. First off, I have no intention to spam this page, but there is much more I could write. This may be too picky, but there are really two distinct meeting locations in Fantasy Faire. 1) The Royal Hall should (but hasn’t always) have 3 princesses greeting guests. The lineup has changed, and isn’t listed on any official Disney web site or the paper guide you can get at the gate. I’d say Aurora, Ariel, and Snow White would be the most common combination. There is a sign outside listing who is inside. If there are only 2 names listed ,this does not necessarily mean that you will meet only two princesses. There will probably a third “surprise” princess. 2) The outside location is not far away from the Royal Hall. The location is hard to describe without a map, but if you are on a path with a bridge heading into Fantasy Faire – near the castle – that is where you are likely to find Belle, Merida, and Rapunzel – one at a time. Flynn used to meet with Rapunzel there, but no longer. Pocahontas is the one princess that I have to say you’d have no chance of meeting on a regular day at Disneyland Park. (Well, Anna & Elsa too technically, but they’re in DCAP now.) Mulan has occasionally appeared in the Royal Hall. Alice and Hatter really aren’t “uncommon” in Fantasyland. They are everyday characters. It would just take too long to explain on what days and when to meet them. They – and Peter Pan – (Mary & Bert occasionally) are the remaining “free range” characters. I know there was character information on m.disneyland.com – I don’t have a smartphone, and can’t access it any longer on my PC. The best place to ask about characters is at the information stand on the left side of Main Street near Refreshment Corner and the Jolly Holiday bakery. Don’t forget to pick up the times guide as you enter. Although not comprehensive, it does give you some general ideas about character meet ‘n greet locations and times. Snow White is an everyday character. Due to the castle refurb for the 60th, “where” is hard to answer. Right now, she appears in the Royal Hall at Fantasy Faire and sometimes at the entrance, by the right tunnel (what you list as Floral Mickey). Her traditional meeting spot had been by her wishing well and grotto. For some strange reason, Aurora took that over several months ago. One place not mentioned above – some princesses (and I’ve also seen Peter Pan) have recently done sets in front to the Dumbo organ. Merida’s meet ‘n greet across from Small World has closed. Your best chance of meeting her is outside – in Fantasy Faire. Tinker Bell should always be in Pixie Hollow. If she’s not, let’s just say that Captain Hook is up to his old tricks. … and I’m sorry to say that you have “common” listed for several characters at Big Thunder Jamboree. “Seasonal” would be more accurate. As an example, in 2015, several rabbits (but not including Oswald) will be there 7 days a week from 3/20 to 4/12, and then on weekends (plus Friday) until June 7. There really isn’t any character that would found there every day. Woody is probably the one you most often find in the area, but actually outside BTRJ. Appreciate the input and I’ll make those changes this week. I’d be happy to have you share more, if you desire. Is Duffy bear anywhere in DLR? No, he used to meet at California Adventure (separate page here), but was removed. We just got back from Disneyland…Elsa and Anna are still meeting together but are now on a Fast Pass system and there is no standby. Fast Passes are gone by 10 am. We got ours the same morning we used our Magic Morning entry and waited about 15 minutes total. (5 minutes to get the pass and about 10 to actually meet them. I would guess however the line by 8:45, 15 minutes before park was open, was about 45 minutes long so I would go there first thing. In addition I was surprised to find a lot of characters throughout the park, and in the morning there is very little wait since times aren’t publicly listed. Crowds were higher then we expected in park and on the attractions. There were lots of character handlers throughout the park and they were very knowledgable on who was out and when/where. (Unlike our last Disneyland visit where no one seemed to know anything) Jake from the Neverland Pirates, Doc McStuffins, and Sofia the First rotate daily. 2 of the 3 will make their appearance on Hollywood Lane and they alternate in half hour appearances. We were able to see Doc, Sulley (across the street) ride Monsters Inc. twice and come out to see Sofia all in a half hour. The fact that they aren’t meeting at the same time seemed to keep the lines down, but they were triple the length in the afternoon. As far as various other characters, we saw Tiana in the front of the Disneyland park mid day and excited to meet Aladdin with Genie and Jasmine at the same time, again with no wait. While we did not personally meet them, we had friends that met Rapunzel and Flynn Rider near the Royal Hall and Merida right outside Small World. We did the Halloween Party and had a great experience. Our tickets were for the party only and we got in at 3 pm and headed to Thunder Ranch for my son’s pirate makeover. While he was being transformed, my daughter was able to walk right up to Minnie, Goofy, Dale, and Donald all in costume. After the makeover we headed over to get in line for Jack and Sally, and caught Woody on the way also without a wait. He came out for the party, but had a steady line the whole time. We were in line at 5 pm to see Jack and Sally, and were the 3rd people to greet them when the party started. After we went to the Villains but did not stay as the line was crazy. I was told that they had 6 Villains out that night, but they were in rotations of 3 so you didn’t know who you would get. All characters had really long lines at this point, so we took an hour to hit attractions. I did learn that the Villains take a break during the fireworks, and the line disappeared however they come back right after…so we were able to start the line back and enjoy the show, and then wait about 5-10 minutes after until they started the meet and greets again. We met Jafar, The Queen, and Frodo from Hunchback. We saw the Queen of Hearts, but she moved so fast you could not take photos or get autographs. Besides characters listed above, during the party you could meet Mickey and Minnie, and there is a Pirate Pals area that rotated between Captain Hook and Mr. Smee and Peter Pan with Wendy. Phineas and Ferb and a Star Trooper are also out. The best value in my opinion was the character breakfast at Plaza Inn. We had 8:10 reservations, so that we could be in-park by 9 am. I would give yourself time – when we got in, Mickey, Donald, Pluto and Minnie were all doing greets and had very short lines. It saved us a trip going back to Toon Town to meet Mickey. Plaza Inn breakfast is called Minnie and Friends and included 9 characters – Minnie, Chip and Dale, Pooh, Tigger, Eeyore, Captain Hook, Fairy Godmother, and Suzy the Mouse from Cinderella. Icing on the cake for my daughter was meeting the fairy Silvermist…she told me before we left home she hoped to see her, but knowing how Tink’s friends rotate there was no guarantee. We got lucky! We did not do the Marvel Superhero characters but our friends did – I think it was Thor and Captain America. Hope this helps others in their DL planning! How likely is it to meet Flynn Rider and Rapunzel? I’m afraid they aren’t as popular, even though they are my daughters favorites. Rapunzel and Flynn meet after their shows in the morning and by the Royal Hall in the afternoon. 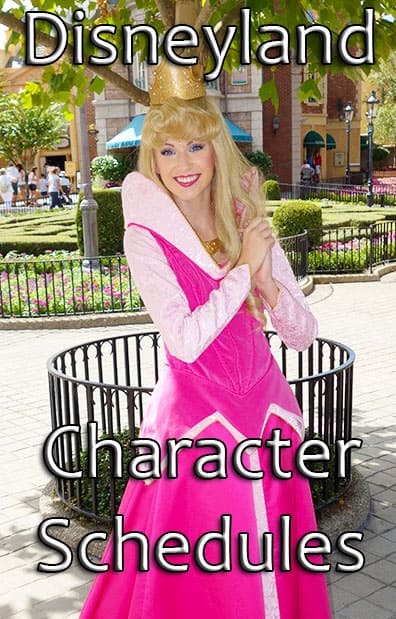 Rapunzel meets every day at Magic Kingdom and is very popular. Flynn only meets for parties and special events. Thanks for all the character information, Kenny! We’re taking our first DL trip this fall. I thought I read somewhere that you can meet Marvel superheroes in the park. Do you know if this is a special limited event or a more permanent meet? My 3.5yo son would love to meet Mickey AND Ironman on the same day. Thor and Captain America have their own location in Innoventions. Anna and Elsa have their own space between Pinnochio and Village Haus in Fantasyland, and with the animatronic Olaf on top of the building, it seems that this may be a more permanent space for them until the next princess feature film. Marry Poppins and Bert have also been meeting guests for meet and greets at the Jolly Holiday restaurant, outside in their dining area, not just their normal spot on Main St. beside the gallery and Mr. Lincoln. Toon Town: new to 2013 allegedly a pre-show will feature the Fab 5 and also Roger Rabbit. Boat Landing: Peter Pan, Wendy, Hook, Mr Smee, Capt Jack Sparrow. Storytellers Cafe Character Breakfast: Baloo, Rafiki, Chip, Dale, Meeko, Pluto. Just wanted to let you know I met Gideon as the park was closing for the night when I was walking out. He had NO LINE there was one person before me. It was awesome and the character interaction was so fun. Thanks for the list! We just went to DL for the first time 2 months ago and were amazed how many characters were just standing around with almost no line. We saw Alice, Mad Hatter, Genie, Max, Pinocchio, Foulfellow and Merida (with her brothers!). There was almost always at least one character as soon as you went through the turnstiles, before even entering Main Street! What a great way to start the day! I have met Max at the character breakfats at Goofy’s Kitchen and PCH Grill. he is a rare add-on though. PCH Grill usually seems to have Mickey, Minnie, Daisy, Stitch, and one special guest. How likely is it to run into Rabbit from Winnie the Pooh? Much more likely than WDW. We met him twice at the Minnie and Friends breakfast too. I have see rabbit once there in the last 9 years.